Victoria benefits from the most developed energy market in the country, meaning there are plenty of opportunities available for customers to save on electricity. That said of course, if you want to save money, you need to know a little bit about electricity first, so you know what to look for. In this article, Canstar Blue explains electricity tariffs in Melbourne and Victoria. We explain what tariffs are available and how you can find the best electricity tariff to suit the needs of your home. Before we go in to detail about tariffs, it’s important to understand the types of charges. There are supply charges and usage charges. Supply charge: A daily fee that applies regardless of how much or how little electricity is used. Usage charge: A charge applied for each kWh of electricity supplied to the property. A ‘tariff’, in the context of electricity, refers to the way your energy company charges you for electricity usage. You may pay the same rate for electricity at all times, or you may be charged different rates depending on the time of day you use power – these are examples of tariffs. There are only a few residential energy tariffs that Victorians need to be aware of, though keep in mind that some tariffs may be unavailable on some networks or through certain retailers and your retailer may refer to them by a different name. As the name implies, a ‘single rate’ tariff charges the same rate for all electricity used, regardless of when or how you use power. This tariff is also occasionally referred to as a ‘peak’, ‘anytime’, or ‘flat rate’ tariff. This is the simplest type of tariff and is available with any meter type. Usage rates on a single-rate tariff in Melbourne are generally charged between 15c/kWh and 25c/kWh depending on the network and retailer. A single rate tariff might be the most affordable option for households which use a lot of electricity during peak demand periods in the afternoon and evening. In fact, it was the ‘go-to’ prior to the mandated roll out of smart meters. Households with smart meters may have automatically been switched to a flexible price tariff, however if you would prefer a single rate, simply contact your retailer to organise a reconfiguration of your meter. If you’re on a flexible pricing tariff and don’t realise, it could be costing you! Here is an example of what Victorian households can expect to pay if they have a single rate tariff. These are some of the cheapest published deals from the retailers on our database that include a link to the retailer’s website for further details. These costs are based on a typical three-person household on the Citipower network in Melbourne, but prices may vary depending on your circumstances. Use our comparison tool above for a specific comparison in your area. These are featured products from referral partners. Our database may not cover all deals available in your area, and please check retailer websites for up to date information. Customers on a block rate tariff are charged one rate for their first ‘block’ of electricity, and another rate for all remaining usage. A block of usage refers to a set amount of electricity used per day, month or quarter. A typical rate for the first block of usage is between 24c and 34c/kWh. The rate for the second block is slightly higher or lower, depending on the retailer. The following tables illustrate what a block rate tariff might look like. Keep in mind that while most households will exceed the first usage block and possibly benefit from the slightly cheaper rates on remaining usage, the savings on a block rate tariff compared to a single rate tariff are often relatively minor. 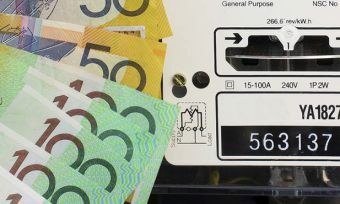 The rollout of smart meters in Victoria was accompanied by the new ‘flexible pricing’ tariff. This tariff applies a different electricity usage rate depending on what time that electricity is used. There are three periods: Peak, off-peak and shoulder. Peak: Electricity is in high demand at these times, so retailers charge higher rates. Off-peak: Electricity is in low demand at these times, so the lowest rate is charged. 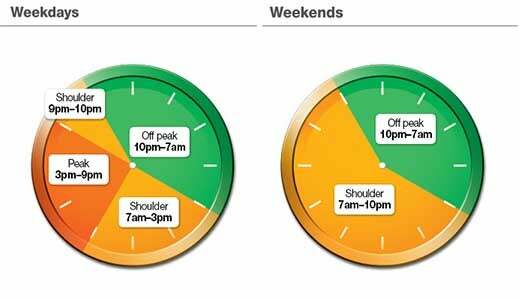 Shoulder: This is between peak and off-peak periods. Electricity is in mild demand and a medium price is charged. There are no peak periods on the weekend. Instead, a shoulder rate is charged for most of the day (pictured). Some retailers, such as Origin, may also charge different rates across winter and summer months. Higher rates are sometimes applied by electricity retailers in summer months compared to ‘non-summer’ months. The summer months are considered to be from 1 October – 31 March for customers on the Jemena, Ausnet Services and United Energy networks. The summer months on the Powercor and Citipower networks are 1 December to 28 February. While the flexible pricing tariff is a popular choice, it might not be the most affordable option for households and businesses that use a lot of electricity in peak demand periods. If you’re on a flexible pricing tariff, try maximising your electricity use between 10pm and 7am. Use appliance timers or hold off using large appliances like dishwashers and washing machines until the off-peak period kicks in. The time of use tariff is similar to flexible pricing in that different rates are charged depending on the time of day. Unlike the flexible pricing tariff however, a time of use tariff doesn’t include a ‘shoulder’ period – only peak and off-peak. There are also different time brackets, as a time of use tariff has a much wider peak demand period, albeit at a slightly lower rate than a flexible pricing tariff. Whether a time of use tariff can save you more than a flexible pricing tariff is not entirely clear. While peak demand with time of use tariffs is slightly cheaper, it is more expensive than shoulder periods under flexible pricing. If you believe your property uses a ridiculous amount of electricity between the hours of 3pm and 9pm, then a time of use tariff might save you slightly more than flexible pricing. That said, unless you take advantage of the low off-peak rates, you might be better suited to a single rate or block tariff. Demand tariffs are relatively new to the residential market and are a little trickier to wrap your head around. Essentially, you are charged a lower rate through either a single or block rate structure in exchange for a ‘demand charge’, in addition to standard usage and supply rates. A demand charge is a daily or monthly fixed fee that is calculated using the maximum half-hourly interval kW demand occurring on a weekday between 3pm and 9pm in that month. This means that if you’re running multiple high energy appliances at once on a one-off occasion, a higher demand charge is applied for the entire month. Base demand charges are also considerably higher around the summer months (Dec-Mar). While the reduced usage rates can help you save, you might end up paying a lot more if you’re electricity usage gets out of hand for even a moment. It’s a risky tariff and it’s for that reason that customers must approach their retailer directly to opt in to this arrangement. Under a two-rate tariff (also known as a controlled load or dedicated circuit), customers can nominate one or more appliances to have metered separately and charged at a cheaper rate than the rest of the property. The catch is that energy is only supplied to nominated appliances during off-peak hours (usually 11pm – 7am), meaning it’s not ideal for most appliances. Two-rate tariffs are most commonly used with electric storage hot water systems, heat slabs, pool pumps, or any appliance that doesn’t need to run throughout the day. Only the nominated appliance will receive a lower usage rate, while the rest of the property’s electricity usage is metered on one of the previously mentioned tariffs. Households with solar panels can receive what is called a ‘feed-in tariff’ or FiT. When your solar panels are producing electricity and no one is home to use it, that electricity is fed into the grid for another property to use instead. In exchange, your electricity retailer will give you a small FiT credit for each kWh of energy your solar system exported. Under state regulation, customers receive a minimum feed-in tariff of 9.9c/kWh, however some retailers will offer slightly more than this. Read our feed-in tariff comparison for more information.